Michel and Albert Roux are a culinary legend. 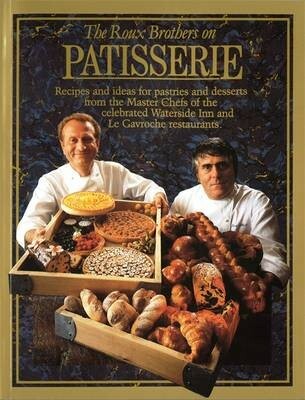 In this book they turn their attention to the French art of patisserie, pooling half a century of their collective knowledge and experience to create, not a general cookery book, but a culinary bible. The Roux brothers guide even the modest cook through the making of the simplest pastry to the most mouth-watering confection, achieving results once within the realm of only the professional chef. With practical advice, tips and hints, the authors set out the various pastry, sponge and dough bases used for desserts and breads, and the creams and fruit-flavoured sauces that complement them. The main recipe section comprises Cold desserts and sweets, Hot desserts and sweets, Hot and cold fruit tarts, Ice creams and sorbets, Petits fours and canapes and finally Cakes. Each recipe lists the equipment needed and provides practical advice on preparation, with hints on presentation, storage and freezing. Finally, the Roux brothers reveal the techniques behind their spectacular, decorative sugar work.